Whopper's Bunker: Do aliens like wool? Reports have emerged in the press within the past week of "Unexplained sheep attacks 'caused by aliens in UFOs'," so claimed by local farmers describing a series of bizarre incidents involving their sheep in Shropshire. They have linked the unexplained incidents, where sheep's brains and eyes were removed, to mysterious orange lights in the sky. 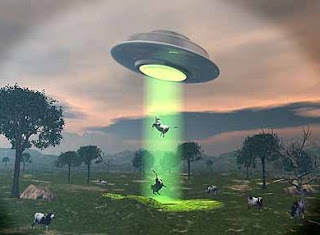 Farmers near Shrewsbury claim to have witnessed sheep being “lasered” by unidentified light from UFOs. They have found sheep with “neat holes” while their brains and other internal organs were removed. Other animals have lost eyes or had their flesh “carefully stripped away”, usually on the left side. Phil Hoyle, 53, who has spent almost a decade investigating how the livestock have died, said the UFOs were found to have roamed a 50-mile "corridor" between Shrewsbury and Powys. Hoyle and 15 members of the Animal Pathology Field Unit, claimed they witnessed UFOs at work last month while working during the night at a Welsh hill farm near Radnor Forest. “The technology involved in these attacks is frightening,” he told The Sun. Someone within the British Ministry Of Defence who declined to be identified, leaked a partially redacted report filed by Colonel "Whopper" Creedon of UNETIDA. Among the sections that could be read were "for OPSEC reasons we must obviously keep this from public knowledge", "caution must be exercised while practicing with these weapons" and "it's not inconceivable that modern weather-balloons could be mounted with surgically-precise high-density lasers".